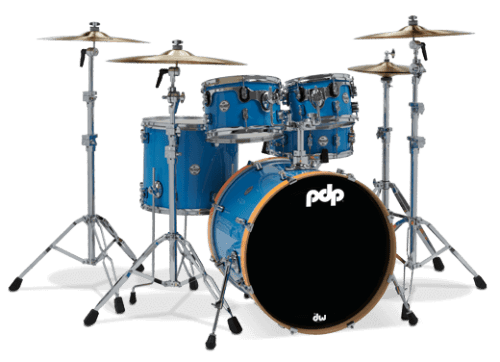 The drum sizes in this kit were inspired by some of PDP’s old-school offerings: 10×7” and 12×8” rack toms, a 16×14” floor tom, 22×18” bass drum, and 14×5” snare drum. Like the Concept Series Drums of our flagship line, the Blue/Orange toms and bass drum are made with 7-ply maple shells, with a 10-ply maple snare. The rack toms rest comfortably in DW’s advanced Suspension Tom Mounts (STMs), while the floor toms stand on PDP’s strong, lightweight, floor tom legs. The snares include PDP’s trusted MAG throw-off, along with fully-chromed snare wires, featuring carbon steel coils and brass end plates. And the bass drum is constructed with die-cast, low-mass claw hooks. 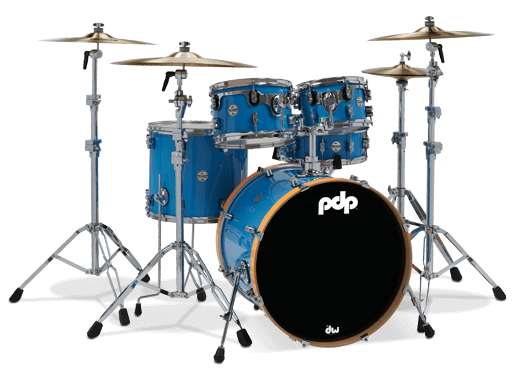 Finally, all the Blue/Orange drums are built with DW’s True Pitch tension rods, graduated counterhoop thicknesses, retro-inspired, dual-turret lugs, and world-renowned Remo drum heads.